UN General Assembly:Ahmadinejad Asks Allah To Hasten Coming Of The Twelfth Imam And Bring Islamic "Victory"
Ahmadinejad Asks Allah To Hasten Coming Of The Twelfth Imam And Bring Islamic "Victory": How Should We Respond? 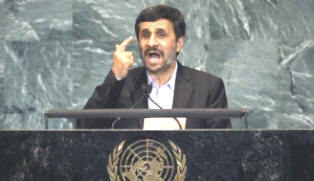 NEW YORK CITY, NY (ANS) -- Iranian President Mahmoud Ahmadinejad made yet another inflammatory speech to the U.N. General Assembly on Thursday (September 23, 2010). He began by praying, "O God, hasten the arrival of Imam al-Mahdi and grant him good health and victory and make us his followers and those who attest to his righteousness." In his latest blog, respected Christian writer, Joel C. Rosenberg, has now weighed in with his views about the speech and what it all means. (See http://flashtrafficblog.wordpress.com). way to 'hasten' the Twelfth Imam's coming is to annihilate the U.S. and Israel. This would bring about the 'victory' that Ahmadinejad prayed for on American soil." Rosenberg went on to say, "The speech went downhill from there. Ahmadinejad accused the U.S. government of masterminding the 9/11 attacks in order to save Israel. Few in the West, including our leaders, understand what Ahmadinejad and his colleagues in the Iranian government believe. And that's the problem. Unless the leaders and the people of the world wake up, war is coming. The leaders of Iran, including the Ayatollah Khamenei, believe it is their job to hasten the the apocalypse and the end of the world. "What should we do in response? We need to get ready and be prepared (Ezekiel 38:7). We need to pray for the peace of Jerusalem, and mobilize others to pray, too. We need to travel to Israel to do pray walks and to encourage Israelis that we are standing with them. We need to care for poor and needy Israelis and Palestinians with unconditional love and unwavering support. We need to stockpile humanitarian relief supplies in Israel and build the infrastructure to distribute even more emergency aid when the next war comes. "We need to strengthen the Church in the epicenter in real and practical ways. We need to help our brothers and sisters throughout the region preach the gospel and make disciples and plant churches and show that Jesus Christ is the Prince of Peace and the only hope of reconciliation." He concluded by saying, "Time is short. But our path forward is clear. Through my forthcoming novel, 'The Twelfth Imam,' I'm trying to help people imagine what the world would look like if Ahmadinejad's world view began to come to pass." Note: Joel C. Rosenberg is the New York Times best-selling author of "The Last Jihad," "The Last Days," "The Ezekiel Option," "The Copper Scroll," and "Epicenter: How the Current Rumblings in the Middle East Will Change Your World," with more than one million copies in print. He is also the founder and president of the Joshua Fund (www.joshuafund.net), a nonprofit charitable and educational organization that provides humanitarian relief for victims of war and terrorism in Israel and the Muslim world.